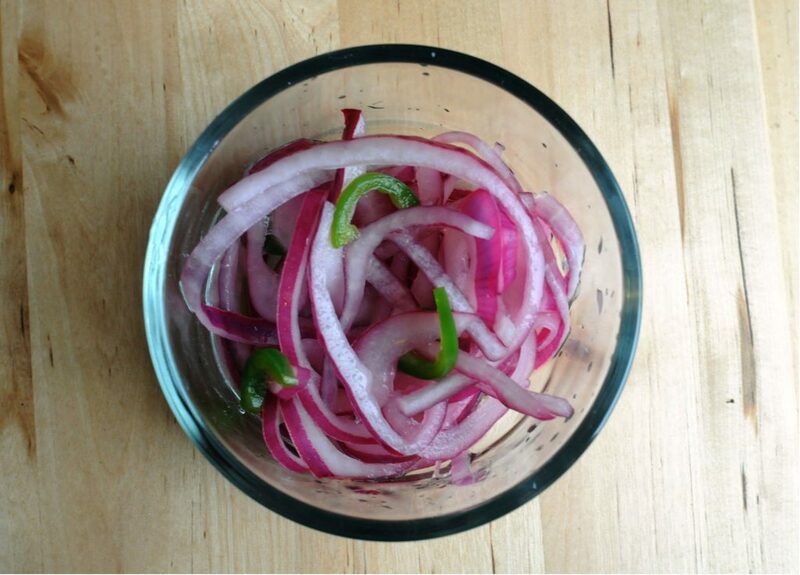 I credit the queen, Deb Perelman, for creating my pickled red onion obsession. She uses them here and there when a dish needs a punch of sour and brightness. This is my favorite version for tacos or anything Tex-Mex. The little bit of jalapeño gives them the slightest kick, but they can also be omitted if you prefer. I love having pickled red onions on hand. They elevate any sandwich, eggs or cheese and crackers snack to something that feels elegant. I like to make a batch at the beginning of the week and throw them on anything I can think of. In a large bowl, whisk together vinegar, water, salt and sugar until fully dissolved. Stir onion and jalapeño slices into pickling liquid. Toss to make sure they are coated with the liquid; they will not be fully submerged. Pickles will keep in the fridge for 3-4 days. Optional jalapeño substitutions: thinly sliced fresh ginger, 1 teaspoon whole spices (such as coriander, fennel or peppercorns), 1 teaspoon chili garlic paste. You can replace the vinegar with another acid for a different flavor profile (such as lemon juice, rice vinegar, red wine vinegar or sherry vinegar).